The role of the contact centre is changing. In this digitising landscape, Greater Bank estimates that 85% of their customers are already online by the time they call a contact centre. The new goal for contact centres isn’t just to provide speedy responses with low wait times. It is also to reduce the number of repetitive enquiries reaching the contact centre by encouraging the use self-service portals. However, the consequent needs of capability uplift for the workforce and implementing these with a customer-centric focus demonstrate that it is not just technology that needs updating. With this in mind, CCW2019 will demonstrate through case studies and interactive discussion that the innovation of people processes and technology will drive contact centres forward. 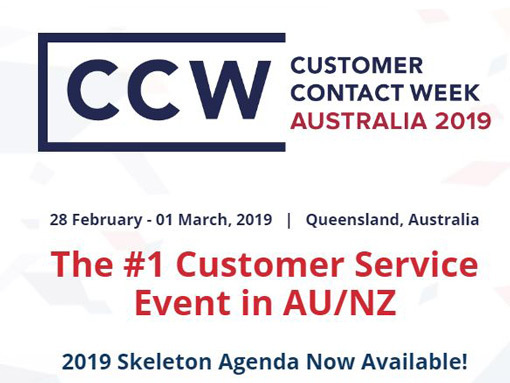 CCW2019 will unite contact centre managers, customer service experts and thought leaders in the fastest growing customer contact event in Australia: the 4th Australian Contact Centre Week Summit 2019. This event is an extension of the world’s biggest Call Centre Week series from the USA.